Just say no to Melo, Gar. Just say no. Disclaimer: I am a fan of New York Knicks’ small forward, Carmelo Anthony, and have been since he helped lead the Syracuse Orange to an NCAA title in 2003. He may be overrated to some, but oddly enough, I feel he is a bit underrated. In my unabashed opinion, “Melo” is the NBA’s best all-around scorer who has mostly been a victim of being on the wrong team, at the wrong damn time. Or something like that. That said, I don’t want to see Melo on the Bulls’ roster at the start of the 2014-15 season. In fact, I don’t even want Chicago Bulls GM Gar Forman to send Melo a warm text message, call and ask about his kids, or even like any of his Instagram posts. If Phil Jackson calls and attempts to gauge the Bulls’ interest in acquiring Melo in a sign-and-trade deal, I hope Forman bursts into laughter before asking, “Wait. Are you serious?” before bursting into laughter again. When Melo decides to opt out of his current contract and test the free agent market, as he has said he will do, the most Gar should do is feign interest in the hopes that a rival grossly overpays for Melo’s services. Melo has said he’ll take a pay cut, although that was in response to a question about his willingness to re-sign with the Knicks. 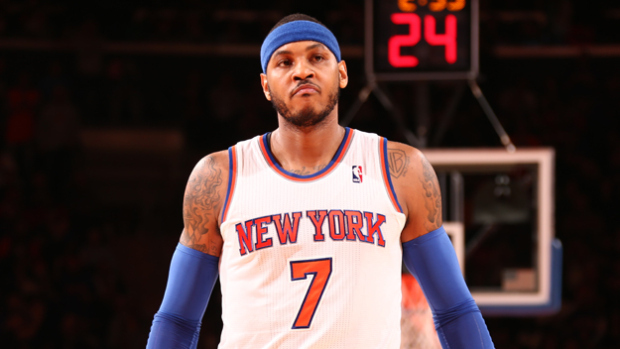 Say Melo decides he’ll take a pay cut to sign with the Bulls. Just say no to Melo, Gar. Just say no. Despite my belief that Melo is much better than advertised (28 PPG, 45/39/84 FG%/3P%/FT%, and PER of over 24 the last two seasons, plus a great rebounder and one of the best in the L at getting to the FT line), I want Forman to stay as far away from his as possible. Even if Melo takes a pay cut, the Bulls are strapped for cash. At the current moment, the Bulls have seven players signed for the 2014-15 season: Derrick Rose, Joakim Noah, Carlos Boozer, Jimmy Butler, Taj Gibson, Tony Snell, and Mike Dunleavy. Combined, they make $62.7 million, so obviously, the Bulls would have to be creative if they wanted to acquire Melo. This, in spite of the fact that the NBA salary cap will actually rise to a little over $63 million for the start of next season. If Boozer is amnestied, which is expected, the Bulls’ salary commitments drop to nearly $46 million, leaving them with $17 million to spend on not only Melo, but another four players as well. The Bulls will select 16th and 19th in this June’s draft, and those salary commitments total just south of $3 million. It’s highly unlikely those two picks won’t make the roster, so the Bulls will be shelling out nearly $50 million in salary, and that’s without Melo and another four players to fill out the roster. The luxury-tax threshold will jump to $77 million in 14-15, so it’s conceivable the Bulls could spend the remaining amount on Melo and parts, but it’s also very conceivable they won’t, because you know, Bulls owner Jerry Reinsdorf ain’t really about that life. Of course, the Bulls could trade Dunleavy and/or Gibson to free up cap space, but the Bulls preemptively dumped salary in order to make a run at a top-notch free agent in the summer of 2010, and they ended up with…Boozer. Simply put, the Bulls are a bit hamstrung, mostly because of Boozer’s contract, which likely won’t be moved via trade. So if they want Melo, they’ll have to give away valuable parts in a sign-and-trade, or simply move players to free up cap space with the hopes they’d land Melo. In both situations, I’m not sure the Bulls would come away a better team. The Bulls should be looking to get younger; add players with upside. Look, Melo is not old. He turned 30 not even a week ago. Technically, one could say he’s in the middle of his prime if we consider an NBA player’s prime to be in the 27-32 age range. Still, I don’t see any real room for development in Melo’s game. At this point, he is what he is, and personally, I think he’s been at his best these past two seasons. But generally, we start to see a bit of a decline once a player hits 30. At 32, 33, Melo may very well still be a very good or even great player, but I don’t think he’ll be as good as he was at 30. Of course, this is all conjecture and Melo could become an even better player by then, but I’ll bet that while he’ll still be very good, maybe even great, he’ll start to show signs that he is a player on his way out, rather than one just starting to find his way. If the Bulls still want to build around Rose, who won’t be 26 until the end of October, they’ll have to add players who will grow with him, not ones who come in with their own identity, accustomed to doing things a certain way. Once the Bulls realize they’re in a relatively fortunate position, they will see the light. This year’s NBA Draft will be a deep one, and there are teams like the Bulls that will be picking in the teens, but don’t view their draft slot as a total crapshoot. It would not be beyond belief that a future All-Star is picked after 15th, and we could easily see a 2nd-rounder or two be a significant contributor for years to come. Again, the Bulls will pick 16th and 19th, high enough to land an impact player, but probably not high enough to land a “game-changer.” In my world, the Bulls take Michigan St. power forward Adreian Payne with the 16th pick and Michigan combo guard Nik Stauskas with the 19th. In Payne, they would get an ideal stretch 4, but also one who isn’t afraid to go to work in the low post and scrap for rebounds. Stauskas is an excellent shooter from long-range, but worked hard to escape the “one-dimensional” label and established himself this past season as a player who can not only hit the 3, but create for himself and others. Hopefully, the Bulls will re-sign D.J. Augustin and have a 9-man rotation that looks like this: PG Derrick Rose, SG Jimmy Butler, SF Mike Dunleavy, PF Taj Gibson (assuming Boozer is amnestied), C Joakim Noah, PG D.J. Augustin, G Nik Stauskas, G/F Tony Snell, F/C Adreian Payne. Only one of them, Dunleavy, will be 30 when the season starts. Pretty damn good. This doesn’t even take into account that the Bulls still own the rights to 6’10” forward, Nikola Mirotic, who is only 23 and already arguably the best hooper in all of Europe. And oh, the Bulls will also get the Cleveland Cavaliers’ 2015 1st-round pick if the Cavs make the playoffs. That pick could be as high as 14th. They will also get the Sacramento Kings’ 2015 1st-round pick so long as it’s not in the top 10, and if it is, the Bulls will own the rights to that pick for the following two years, with the same stipulations. The Bulls need to realize that they still have a young Rose, 2013-14 Defensive Player of the Year and 1st-team All-NBAer Noah, a good power forward in Taj, promising wing in Butler, as well as future 1st-round draft picks and Mirotic. Desperate, the Bulls should not be. Calling the 2013-14 Bulls offense “anemic” would be a gross understatement. They finished dead last (30 out of 30) in points per game (93.7) and field goal percentage (43%). In terms of pace, the Bulls finished 13-14 29th (90.2), 28th in Offensive Rating (102.5), and 24th in three-point field goal percentage (35%). They’re in the middle of the pack in their ability to get to the free-throw line and were one of the worst in the league at protecting the ball. Their saving grace was their willingness to play defense as if their lives depended on it. Obviously, adding Carmelo Anthony would help the Bulls improve tremendously on the offensive end. But, I worry about the Bulls’ current cap situation, Melo’s ability to grow in the coming years, and most importantly, I feel the Bulls have enough viable pieces (should Rose come back healthy, Boozer gets amnestied, and they draft reasonably well) to contend for a title in 2014-15 and beyond. It would make the most sense for Melo to try and navigate his way to Chicago, but what the Bulls would have to sacrifice would ultimately be too much. You can look, but don’t touch, Gar. Karen Brown was the greatest. No WordPress? Cool. Leave your e-mail address, anyway. It's worth it. I have time to kill! No need for a WP account. Submit your e-mail address for notifications of my posts.